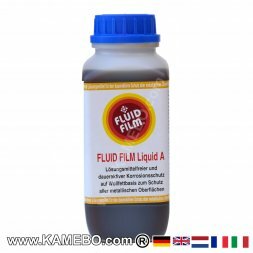 FLUID FILM is a solventless rust inhibitor based on lanolin (wool fat). It does not harden, it remains permanently elastic and fluid. 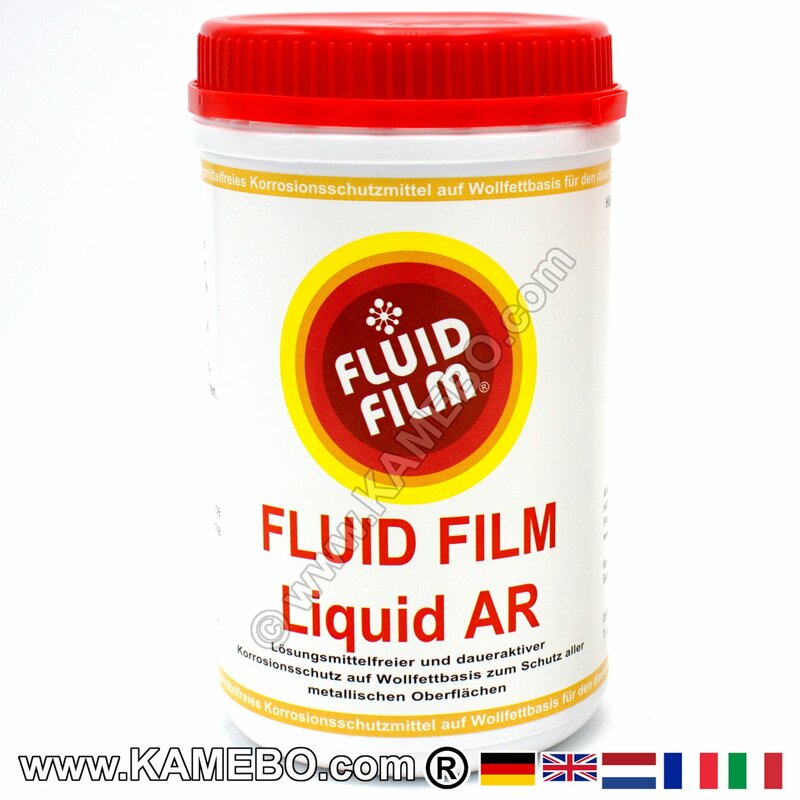 FLUID FILM LIQUID A: very thin, excellent penetration. FLUID FILM LIQUID AR: viscous, much like grease. 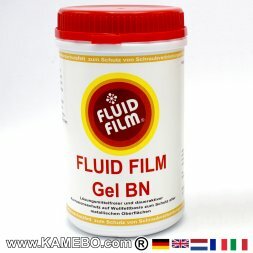 FLUID FILM GEL BN: very thick, not liquid. 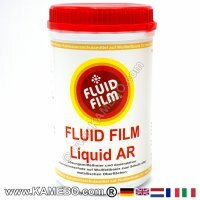 FLUID FILM varieties are oil-like or grease-like and cannot be painted! FLUID FILM LIQUID AR: long-term rust protection of iron, steel, metal, also for steel wire ropes. FLUID FILM GEL BN: only elastic, not fluid, long-time rust protection, for sheet pile retaining walls, temporarily under water, antirust protection of ships, offshore units, for chain cases, anchor locker and cofferdam for open gears of construction machinery and ships, docks, for the sealing of folding, rust protection of winter service equipment and winter service vehicles, hydraulic and screw connections. 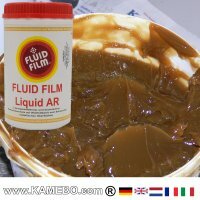 FLUID FILM LIQUID A as penetrating oil for rusty cavities. For long-lasting antirust protection an after-treatment with LIQUID AR is required after a few weeks, at the latest after 6 months. FLUID FILM NAS: as a penetrating oil for rusty cavities, for long-lasting rust prevention post-treatment with LIQUID AR is necessary after a few weeks, at the latest after 12 months. FLUID FILM AS-R: as a penetrating oil for rusty cavities, 60 cm-long cavity probe for the spray can be ordered separately, if not included in the delivery. 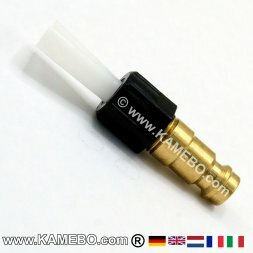 For lubrication of hinges, antennas etc. Corrosion prevention of ballast water tanks: possible with LIQUID A, NAS and AR. FLUID FILM LIQUID A is very well suited to oil untreated wood. 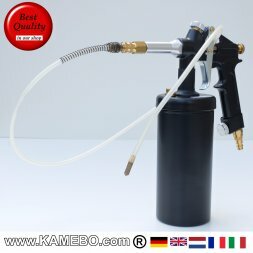 Processing with brush, air paint spray gun or spray guns for spraying agents. FLUID FILM stops rust - but it removes no rust. It prevents the supply of oxygen and moisture to the metal. LIQUID A, NAS and AS-R have slight penetrating properties, rust may flake off after treatment. In case of strong rusted parts, rust may even spread under the treated surface. The better you remove any rust, the more durable the new antirust protection will be. FLUID FILM LIQUID A, NAS, LIQUID AR and GEL BN can be processed with a brush. 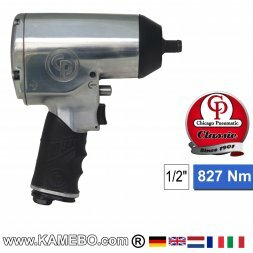 For best results in cavity protection an air spray gun / pneumatic spray gun VAUPEL 3100 ASR / 3200 ASKR / 3300 HSDR (with thin probe, with a diameter of 6 mm and 1.15 metres long.) 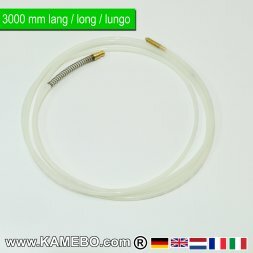 Probes up to 3.5 meters are available as accessory). 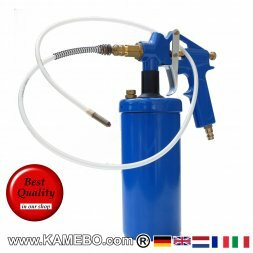 Pneumatic spray guns have more performance by excess pressure, they provide a finer nebulisation of corrosion inhibitor in the cavity. 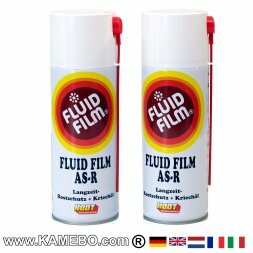 FLUID FILM LIQUID AR can only be processed with overpressure pneumatic spray guns. Optimal: VAUPEL 3100 ASR and 3200 ASKR (90 mm wide cup opening, even the tough fat is quickly poured in). For processing, LIQUID AR has to be warmed up (at maximum + 45 degrees Celsius). Optionally it has to be diluted with approx. 10% LIQUID A or NAS. 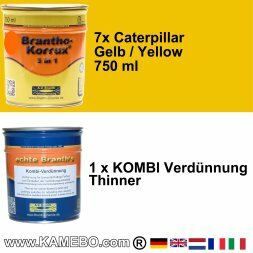 Low viscosity corrosion protection oil for temporary rust protection. Especially for heavily rusted cavities. Cavities need a final treatment with FLUID FILM NAS or LIQUID AR.